Beyond the 5K and a great segue to 13.1M. 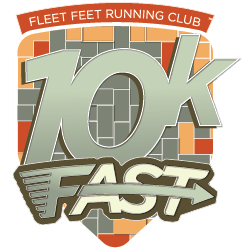 Train for the magical 10k distance with Fleet Feet Running Club! On one hand, completing 6.2 miles demands your respect and attention, but on the other, it isn't so far that you can't train for it—and complete several 10ks—in one season. It's one step beyond the 5k (or 3.1-miles) and a great segue to the half marathon distance (13.1-miles). Our 10-week, 10k Finish program is designed for the casual runner and our 10-week, 10k Fast is intended for the experienced, competitive-minded runner. Why join our 10k programs? Experienced, professional head coaching. Our degreed and credentialed head coaches assess each participant's current fitness level, help them set reasonable goals, and ensure that they train at an appropriate level. Group Camaraderie. Group training is like having a personal fitness support group. Our support group meets twice weekly. An introduction to speed training. Speed training adds some spice into training. Our 10k programs teach the principles of speed training and develop workouts that are individually tailored to program participants. The 10k Finish program is designed for the currently-casual athlete who is ready to take their training to the next level. We'll delve a little deeper into the subjects that will help you go beyond the 5k: speed training, nutrition management, hydration, safety & visibility, and more. Throughout the 10-week program, you'll gradually increase your mileage as you train mentally and physically for the 6.2-mile distance. As always, our great Fleet Feet coaches and mentors will be with you every step of the way. Despite being “short” from a distance runner’s standpoint, the 10k is a difficult race distance to master. The 10k is a blend of speed and endurance that necessitates running only a few ticks slower than 5k pace, yet for double the distance. Our 10k Fast program is designed to prepare advanced competitors for the exact physiological challenges of the 6.2-mile distance, teach the body and mind how to push through the tough parts of a race, and perfect a pacing strategy that pushes the limits. Our Summer 10k Finish and Summer 10k Fast programs will begin with kickoff meetings on July 27th. We train Tuesday evenings and Saturday mornings. Folks in our 10k Fast program meet on Sundays, too. If you are an Active-level member of Fleet Feet Running Club (FFRC), we invite you to pass the time before your program begins by joining us for our Thursday evening and Sunday morning social runs. If you are not yet an Active member, we hope you will register and then join us. Among other benefits, Active FFRC members receive a discount on training programs. To become an Active member, click here. 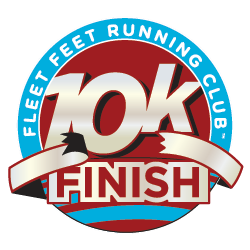 To register for the Summer 10k Finish, click here. To register for the Summer 10k Fast, click here. 10k Training Cost: Active-level club members receive a 15% discount.